The United Press syndicate published an eye-opening story in 1951 — a 32-year-old German soldier had emerged, “bearded, blinded and blubbering,” when workers cleared wreckage from the entrance to a Nazi supply depot in Babie Doly, Poland. Decide for yourself — here’s another UP story, and here’s an account in Time magazine. The story also turns up in the 1958 German film Nasser Asphalt and inspired the 1973 English film The Blockhouse, with Peter Sellers. 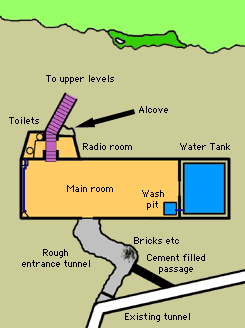 Related: During World War II, British naval intelligence conceived “Operation Tracer,” a secret plan to seal a group of soldiers in a bunker at the top of the Rock of Gibraltar, so that if Nazis captured the rock the hidden soldiers could observe the movements of enemy vessels and report them to the Admiralty by wireless communication. A chamber, shown here, measuring 14 × 4.8 × 2.4 meters was constructed secretly in 1942, and six men volunteered to be sealed inside for at least a year (they had provisions for up to seven years). But the plan was never put into effect, and the empty chambers were ordered sealed. They came to light only in 1997, when they were discovered by the Gibraltar Caving Group. The Woodrow Wilson Bridge carries the Capitol Beltway across the Potomac River south of Washington, D.C., connecting Maryland on the eastern shore with Virginia on the western. The southern tip of Washington’s jurisdiction just touches the bridge’s westbound lanes — a 90-meter section of that span belongs to the District of Columbia. This makes the Wilson the only bridge in the United States that occupies three jurisdictions. This sounds like an opportunity for some sort of perfect crime, but I can’t quite work it out. 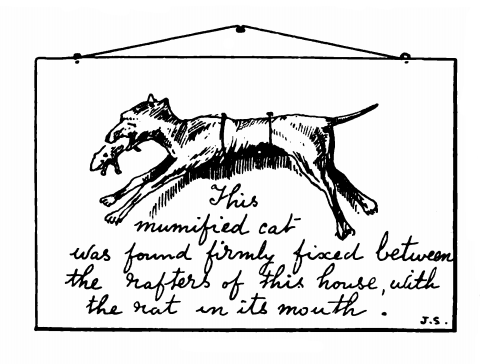 Whenever I passed, some few years ago, a certain shop-window in the West-end of London, I usually had an additional peep at a large card to which was attached a mummified cat grasping a mummified rat firmly in its jaws. If I remember rightly, these animals were discovered, in a preserved, albeit shrunken and dusty, condition, imprisoned between some rafters in the house during repairs. Evidently the unfortunate cat got jammed in its peculiar position accidentally, and being averse to releasing its own prisoner, and thereby being better able to release itself, held it securely until suffocation to both ensued. It was a striking illustration of the powerfulness of determination exercised by even the smaller class of animals. 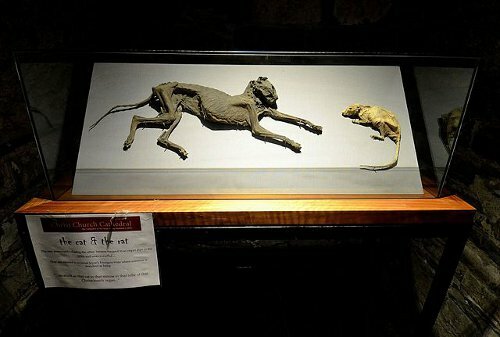 In the 1860s, workers discovered the remains of a cat and a rat behind the organ in Dublin’s Christ Church Cathedral. There’s no telling how long they’d been there. Their bodies had been desiccated in the dry air of the church. In it, California economist Marc Reinganum notes that anyone with a time machine would have an enormous incentive to manipulate investments and futures markets, using his knowledge of the future to amass huge profits. If this were possible at all, it would be happening on such a large scale that interest rates would be driven to zero. So the fact that we see positive interest rates proves that time travelers don’t exist. Indeed, death can coexist with immortality. Consider Miss Paginate. She is born in 2000. In 2030 she time travels to a future funeral in 2050. 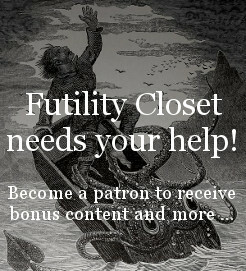 She finds herself in the coffin as a fifty-year-old. Just as a distinction between temporal parts allows you to both sit and stand, it also allows Miss Paginate to be both dead and alive. Indeed, by slowing down her aging to an asymptotic rate from 31 to 39, Miss Paginate lives forever. At age 40, she finds herself back in 2040. She learns that she has been missing from 2031 to 2039. Miss Paginate also discovers that her normal rate of aging has resumed. She commences a memoir of her life, with special attention to the infinite portion that commences from 2050. She regrets her upcoming death in 2050. That will deprive her the time needed to complete her autobiography. But she takes comfort in knowing that she will live forever after her death (albeit as something akin to a partial amnesiac — since she will not remember her experiences from forty to fifty). This unassuming house in Petersburg, Va., has an odd history — it was constructed from the tombstones of Union soldiers who had besieged the city in 1864. The curator of the city’s museum told author Gwyn Headley that, apparently to save on maintenance, nearly 2,000 marble headstones were removed from Poplar Grove Cemetery and sold to a Mr. O.E. Young, who assembled them into a two-story house. Canals a thousand miles long and twenty miles wide are simply beyond our comprehension. Even though we are aware of the fact that … a rock which here weighs one hundred pounds would there only weigh thirty-eight pounds, engineering operations being in consequence less arduous than here, yet we can scarcely imagine the inhabitants of Mars capable of accomplishing this Herculean task within the short interval of two years. 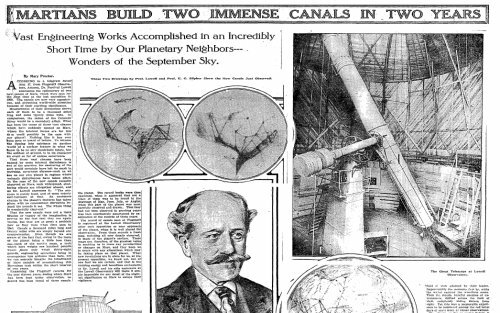 The Times was relying on Percival Lowell, who was convinced that a dying Martian civilization was struggling to reach the planet’s ice caps. “The whole thing is wonderfully clear-cut,” he’d told the newspaper — but he was already largely ostracized by skeptical colleagues who couldn’t duplicate his findings. The “spokes” he later saw on Venus may have been blood vessels in his own eye. W.H. Coltharp had a problem. 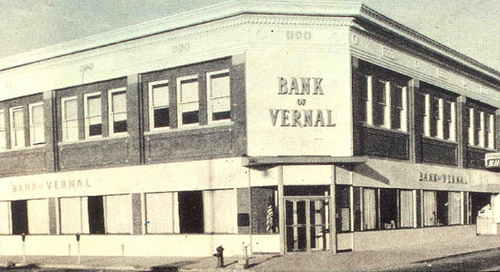 He’d been asked to build a bank in Vernal, Utah, but the bricks he needed were in Salt Lake City, 127 miles away. Wagon freight would have been too expensive, so in 1916 he sent 15,000 bricks by parcel post, essentially mailing the bank to Vernal. The post office was not delighted with Coltharp’s ingenuity. Postmaster General Albert Sidney Burleson wrote that “it is not the intent of the United States Postal Service that buildings be shipped through the mail” — and he set a new limit of 200 pounds per day per receiver. A clown’s face is his livelihood; it’s an unwritten rule among clowns that one must not copy the face of another. Accordingly, in 1946 London clown Stan Bult began painting the faces of his colleagues onto eggshells, effectively trademarking their identities. Bult’s collection was largely destroyed in an accident in 1965, but London’s Circus Clowns Club resurrected the practice in 1984 and added samples of its members’ costumes and wig hair, making each into a peculiar sort of portrait. In 1979, Leon “Buttons” McBryde, a clown with the Ringling Bros & Barnum and Bailey Circus, heard about the British practice and established his own egg registry, which now includes hundreds of portraits of clowns hand-painted by his wife, Linda. The U.S. registry has been used in at least one court case in which one clown charged another with infringing his design. The images above, of the British collection, are by photographer Luke Stephenson; more can be seen on his website. 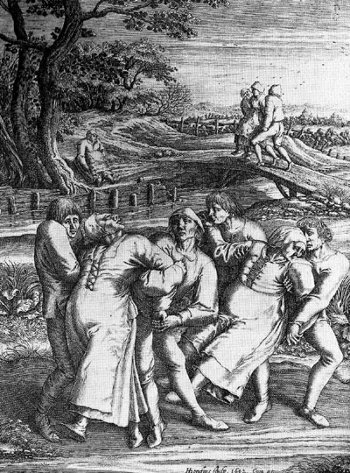 In July 1518, a woman named Frau Troffea stepped into a street in Strasbourg and began to dance. As onlookers gathered it became clear that she could not stop; after many hours of exertion she collapsed and slept briefly but then rose and again began the dance. After three exhausting days she was bundled into a wagon and taken to a shrine in the Vosges Mountains, but her example had had its effect. Within days more than 30 more people had begun to dance uncontrollably, and their numbers grew; according to one chronicle, within a month 400 people were dancing. Many have died of it. The sickness lasted until early September, when it passed away just as mysteriously. A number of explanations have been put forward, including convulsion brought on by ergot, a mold that flourishes on the stalks of damp rye. The most convincing was advanced by John Waller in his 2008 book A Time to Dance, A Time to Die: He found that a series of famines had preceded the dancing plague, spreading fear and anxiety through the city, and that a Christian church legend had told that a wrathful Saint Vitus would send down plagues of compulsive dancing on anyone who angered him. The dancing, Waller believes, was a “mass psychogenic illness” brought on by this belief.